Norfolk boasts a large and diverse range of voluntary, community and social enterprise (VCSE) organisations. Community Action Norfolk is the leading organisation for engagement with the VCSE sector. Alongside strategic work championing the voices of the VCSE sector we provide practical support to organisations and communities. There are 3,598 registered charities that describe their area of operation as including Norfolk. That doesn’t include unregistered charities, various social enterprise structures and the many informal community associations. Some research would suggest that the total number of VCSE organisations in Norfolk may be as high as 10,000. Collectively as a sector we provide a unique and highly valuable contribution to our communities. Our goal is to provide you with the support you need to maintain and enhance that contribution. We do this through VCSE engagement alongside practical support to organisations and communities. For us VCSE engagement is about gathering your ideas, issues and challenges and bringing them together with those of other VCSE organisations and stakeholders to create a positive dialogue so we can collaboratively find ways to make Norfolk stronger and fairer. Community Action Norfolk, together with Momentum Norfolk, have been commissioned by Norfolk County Council to deliver a programme of Voluntary and Community Sector Engagement. VCSE Engage – Is the name we use to describe the Norfolk County Council funded engagement programme. 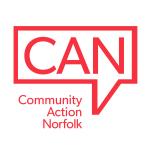 Community Action Norfolk and Momentum Norfolk work closely to deliver the VCSE Engage programme, whilst tailoring activities to provide services built around the needs of the organisations with whom we work. Find out more about our approach. Communications Hub – We know one of the things that is most important to you is getting the right information. To support this we provide a communications hub, collecting information from a variety of sources and distributing to you in different forms and where possible targeted to your specific interests. Make sure you are registered on our website to stay informed. Partner Exchange – We want to help you find the right partners and contacts whether they are inside Norfolk County Council, other VCSE organisations or in the private sector. If you want to do something, know you will need to work with someone else to do it, but are just not sure who, get in touch. Operations - Support you to run your day to day activities well by helping you to develop the systems, processes and policies that mean your organisation operates efficiently, safely and legally. Skills and Knowledge – Support the people involved in your organisation understand their roles and develop the skills and knowledge they need through training and support.